Generally, heat should not be applied to an acute neck injury (3-4 days) or where discoloration or swelling is present. Heat can produce an increase in internal bleeding and swelling where there is significant damage. A strain of a muscle is similar to a cut on a finger. There is pain, swelling and bleeding. You would not use heat initially until the bleeding stops and the tissue forms a scab or scar. Initially, the use of ice for neck pain relief would be recommended, except if you wake up in the morning with a stiff neck from sleeping under a cold draft; Then use heat for neck pain. Moist heat has advantages over dry heat in that water conducts heat much better compared with air. In fact, moist heat penetrates more deeply than dry heat by a factor of 27 times! 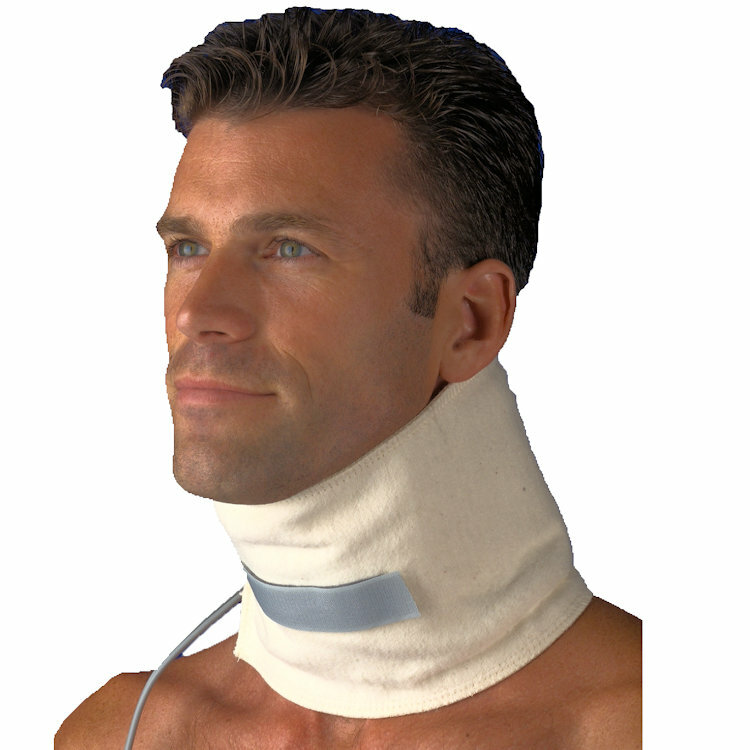 The neck is capable of tolerating a higher level of temperature with moist, than dry heat. When moist heat is delivered to sore neck and shoulder tissue, blood flow increased to the areas as the circulatory vessels widen. An increase in blood circulation can help relieve static inflammation for chronic conditions, as well as bring healing oxygen to the tissues as toxic substances and waste are carried away, offering soothing relief from pain. Our heat therapy products are designed to break a chronic cycle of muscular spasm and pain, which provides increased mobility and stress relief. 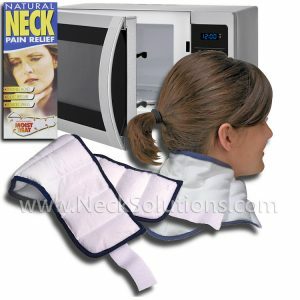 Heat may be used to ease chronic neck pain associated with arthritis and/or poorly healed neck injuries. 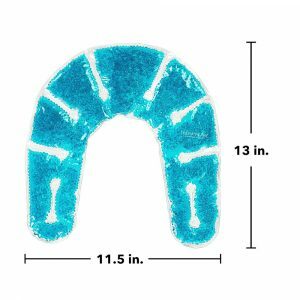 The easiest and most effective way to apply heat to the neck muscles is the use of neck wraps designed specifically for the neck. Other methods of applying heat for neck pain relief are hot showers, hot water bottles, neck wraps, hot tubs and electric heating pads. Most use moist heat and our new wraps using infrared heat therapy. Hot water bottles are frequently used to apply heat. Fill the bottle half full of hot water. Remove the excess air by pressing it above the water level with your hands, this helps it conform more readily to the body. Check the temperature against the back of your hand or forearm to make sure it’s not too hot. A towel wrapped around the bottle provides comfort and safety. After applying heat, hang the bottle upside down to dry. A disadvantage to this method is that the water cools rapidly and must be changed frequently. Hot tubs or heated whirlpools can relax neck muscles and ease joint stiffness. The temperature of the water should be about 104F (40C). Higher water temperatures may produce a sensation of fever and/or drowsiness. Do not drink alcohol while using a hot tub. 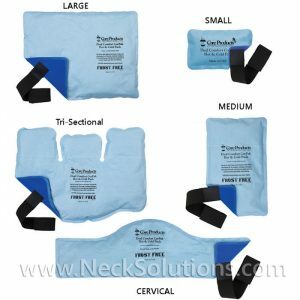 I do not recommend this method for the neck, instead, use a shower which can be more easily controlled and provides a better neck posture. 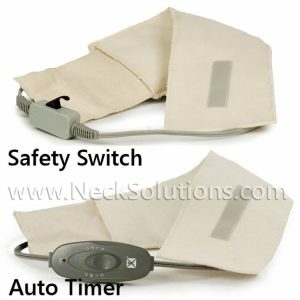 Another method to apply heat for neck pain is electric heating pads. 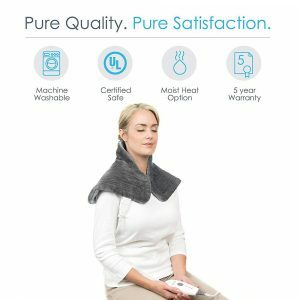 Again, I do not recommend this type of heat for neck pain unless it is moist heat. 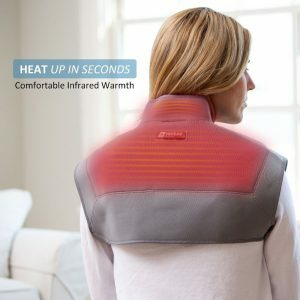 Most electric heating pads are not designed for the neck, have limited flexibility and may cause burns if set too high and you fall asleep during use. Additionally, many electric heating pads use a dry type of heat which may cause congestion and irritation. You should never; lay on the heating pad, use pins or other metal fasteners, use without a cover or fold sharply. 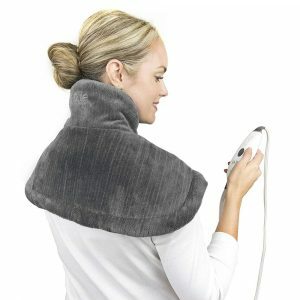 Fortunately, many heating pads use a moist heat and are designed for the neck and shoulders. One uses a safety switch options, however, they both have timed and controlled moist heat. This greatly improves safety and comfort. While you are tied to an electric cord, they provide the most consistent form of moist heat, without having to get up and use a microwave. A word of caution when using heat for neck pain. Never apply creams, gels or ointments prior to the heat. These types of products can cause a numbing sensation and prevent you from feeling exactly how hot the heat really is on your neck. A nice way to continue therapy after using heat is to apply on of our topical pain reliever products as the warmth generated from heat application allows deeper penetration. Another note about the disposable hot packs advertised frequently. Continuous low level dry heat therapy has been around for many years and the disposable hot wraps that stick to your body designed for 8 hours of application uses use iron oxidizing technology which produces a dry heat applied directly to the body has not been proven to be more or less effective than a single 20 minute moist heat application. Some materials in disposable heat wraps are toxic if swallowed and can cause irritation when held against the skin for hours. Moist heat treatment is certainly one of the frequently recommended treatments for various kinds of acute (recent) or chronic (long lasting) pain. Headaches, as well as sinus problems or even migraine headaches may be alleviated or maybe diminished using moist heat on the facial area or on the neck region. Some residual after-effects associated with sports injuries, surgical procedures, broken bones as well as automobile accidents can be frequently minimized by using heat following the 1st 24-36 hours of an injury, depending on the severity, to increase blood circulation into the region, to help decrease bruising, inflammation, muscle spasms, swelling, stiffness as well as pain. Tendons as well as joint problems for example jaw or TMJ dysfunction, wrist problems like carpal tunnel, tennis elbow or tendonitis, shoulder joint or rotator-cuff issues as well as knee pain; irrespective of whether coming from damaged cartilage material, hyper-extension, osteoarthritis or medical procedures, frequently responds in a favorable manner to moist heat therapy following the initial, acute phase. Various kinds of muscular spasm, upper and lower back and neck pain, arthritic pain, almost any problem that involves painful inflammation or swelling could possibly be alleviated using a short moist heat treatment. Consider this 2002 study in the journal Spine using heat wrap therapy was shown to be superior to maximum nonprescription dosages of acetaminophen and ibuprofen for the treatment of acute nonspecific low back pain. Heat wrap therapy was superior for pain relief, reduction in muscle stiffness, improved flexibility, and reduction in disability, as compared with both acetaminophen and ibuprofen. 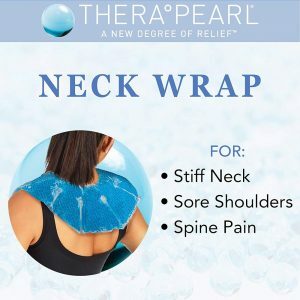 The heat wrap therapy study can be used as a guide for the neck and should allows patients with non-specific neck problems to similarly receive pain relief and return to normal activity. 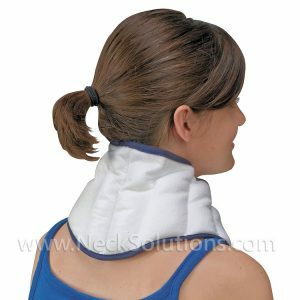 Heat is a great method to ease neck muscle soreness. 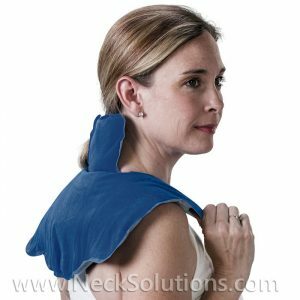 I recommend using a neck wrap for 15-20 minutes prior to using the neck exercises recommended here to warm up the muscle for added flexibility. Another effective way to use heat is in conjunction with self massage to specific areas of neck muscle strain called trigger points.